Behind any championship team on the field, is an equally important support team off the field. Last season we brought you an interview with BC Lions strength and conditioning coach Chris Boyko who keeps the players ready for battle physically. Off the field there is a whole other side to the game that is just as integral to the success of any football team, and video coordinator Justin Coderre plays a big role in the day to day operations of the team. Justin accepted our invitation to tell our readers a little more about his job, and how it helps the team prepare to execute their game plans week to week. BCLD: Justin, thanks for taking the time to talk with us, maybe we can start by asking you how your off-season has been and share your feelings on how last season started and how it ended. JC: No problem at all. The offseason was very busy for myself. I became a father for the first time in December. It was a boy, Brady Coderre. The CFL draft occupies a tremendous amount of time during the offseason. I am responsible for collecting and preparing all the video from CIS and NCAA schools and making sure all coaches have access to everyone we are evaluating. I also help Neil McEvoy out in the player personnel department, returning phone calls to agents, watching film on free agent prospects. I am also busy with various projects for the coaches in preparation for the upcoming season. The 2011 season was unlike anything I have ever experienced. I have been a part of the CFL since the year 2000 and have never been around a better group of guys who enjoyed being around each other. I was a part of the team that won the Grey Cup in 2006, incredible talented, but the adversity and pressure the whole team was under this past year was incredible. The expectations of playing at home in the Grey Cup, two different stadiums, the 0-5 start, the 11-2 finish. As crazy as it sounds, even when we were 0-5, I never felt like the players, coaches or staff gave up! It was the most resilient group of men I have ever been around. I am just incredibly grateful that I got to be a part of and contribute to one of the greatest seasons in CFL history! BCLD: It certainly was an incredible year, and congratulations on your new son! How did you get into the field of video and more specifically what was the path you took to arrive at your current position with the Lions? I read in Bob Ackles book, “The Waterboy”, that Wally brought you with him from Calgary? JC: I am a graduate of the Radio/Broadcasting program of Mount Royal College in Calgary. While in school I learnt how to operate video cameras and how to edit the film afterwards. Upon graduation I moved back to Regina and applied for a video assistant job with the Saskatchewan Roughriders. I was with the Roughriders for the first two seasons of the Roy Shivers/Danny Barrett era. From there I took a vacant Video Coordinator position with the Calgary Stampeders. After the 2002 season, Wally left to take the GM/Head Coach position here with the BC Lions. He asked if I would join him out west, I followed! Best decision I have ever made! BCLD: During the season, describe a typical day in the life of Justin Coderre? JC: A typical day starts at 7am. I make sure all coaches have everything they need to be prepared for their morning meetings with the players. I check all meeting rooms to make sure all computers and projectors are operational. I go through the locker-room to check if any players have any video requests. Once meetings end practice starts, that is when all the fun starts. 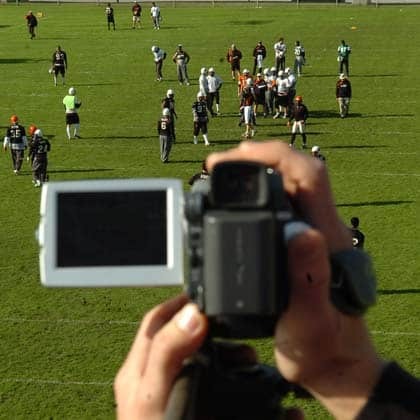 We film almost every segment of practice from a sideline view and an endzone view. After practice is over we edit all the film we have captured. I have an assistant, Andrew Millin, who helps me on a day to day basis. Once finished, we share all the video to the coaches. We repeat this process every practice day. BCLD: Training camp is coming up and part of your job will be to film the sessions. How does training camp differ from your regular season work, if at all? I would assume there are requests for film on players that may be on the bubble to make the team? JC: Training camp is definitely a little different from a normal practice week during the regular season. The one major difference is the fact that you are not doing any preparation for an opponent. It is more offense vs defense work at training camp, whereas during the season you are doing more work based on the opponent you are playing. You may do a little game prep for one of your preseason opponents, but the amount of prep is drastically different during a regular season week. As far as requests for film of players on the bubble, that is something that does happen during training camp. When that time comes those requests are usually given to me by Wally or Mike. Most of the time they would like me to compile a chronological breakdown of the players reps at camp. With the video system we have, those requests are very simple to compile. BCLD: Has the thousands of hours of video you have taken made you a better student of the game? In other words, when you started this job, did you have the football knowledge you have now? JC: I believe that I have become a better student of the game because of my work within the video department. Also I believe being around the tremendous football minds I have been around has also helped me and my continuing education in the game of football. Men like Wally Buono, Mike Benevides, Dan Dorazio, Jacques Chapdelaine, Mark Washington, Roy Shivers, Bob Obillovich, have all been very helpful to me. They have taken the time to answer questions and give myself advice. I want to be involved with football the rest of my life, the more I can learn from the great men involved with this game the better!! BCLD: I read in another article that you often get special requests, not only from coaches, but from players as well. Can you share a few of the more unique requests and what player on the team would you say is the biggest student of video? JC: Special requests from players happen all year long. Most of the requests have to do with highlight videos that they are making for either themselves or to show family back home in the USA. We have alot of guys on our team who watch video. One guy who sticks out in my mind is James Yurichuk. He is someone who is always in my office with his IPAD looking for as much film as he can get his hands on. Another guy who is a big film watcher is Travis Lulay, I can always find him watching film hours after practice is over. BCLD: Does video play a big part during a game? JC: I know that the TV copy plays a big part during a game because of INSTANT REPLAY. As far as the video I am capturing, it is something that is watched by the coaches after games. BCLD: How has your field changed for the better over the years? With today’s technology one would think that since you started you have seen a lot of changes. JC: I have seen many changes over the 13 years I have been doing this job. When I first started in the CFL, we were using SVHS as our format. Editing was all done VCR to VCR. This was a very tedious process. I spent many LONG hours editing and creating cutups for coaches to watch. Now all video editing is done with football specific editing software. Everything can be done on computers. As of today all CFL teams are completely tapeless and exchanging video over the internet. We are using technology to our advantage now. BCLD: Last question Justin; I see you’re a native of Regina, Saskatchewan. Were you ever a Riders fan, and if you were, can we assume you bleed orange and black now? JC: I can honestly say for a brief time as a child I was a Rider fan. As a teenager I loved the Calgary Stampeders, I was a huge fan of the Doug Flutie /Allen Pitts combination! Now I am BLACK AND ORANGE through and through!!! I love this organization and province!! BCLD: Justin, thanks for your time. Keep up the great work with the Lions, and best of luck this coming season. We’ll see you at training camp! JC: Thank you very much! 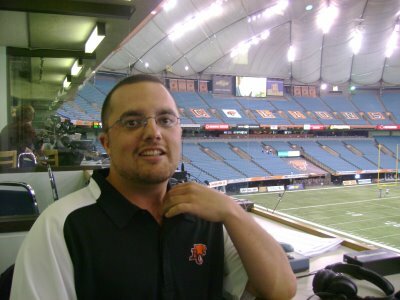 I hope everyone enjoys the 2012 BC Lions season! Go get tickets people, it will be an amazing year! !